Tyson Fury took a step closer to a world title fight as he defeated Kevin Johnson with a unanimous decision victory in Belfast. Fury, who takes his unbeaten record to 20 fights as a professional, failed to replicate the drama of rival David Price's knockout victory on Friday, but it was a disciplined performance as he came out on top in the Odyssey Arena. The Brit, who is now in line for a shot at WBC heavyweight champion Vitali Klitschko, should the Ukrainian decided to return to the ring, sparked boos from the crowd as he failed to take the contest by the scruff of the neck against an opponent who only had three weeks' notice for the fight. Johnson, who went the distance with Klitschko three years ago, appeared content to soak up much of the pressure before launching into a rare onslaught, pinning his opponent in the corner. The American had the better of the seventh round, but was largely on the back foot as Fury showed glimpses of the of the fearsome power that has seen him secure 14 knockout wins in his career, only to lose momentum. Having been called out by David Price following the Liverpudlian's second-round knockout of Matt Skelton on Friday night, Fury looked heavy on his feet as he shaded the early rounds. Some stiff jabs and heavy combinations did enough to see him rack up the points, and some big body shots got him out of trouble when Johnson had him on the ropes. 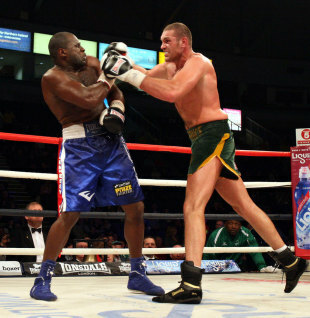 Although Fury appeared to step up the work rate in the sixth, he was warned by the referee for leaning into his opponent. He raised his arms in triumph in the eighth round after a combination left Johnson reeling, but he was forced to drop his gloves quickly as Johnson struck back. Sections of the crowd began to show their frustration as the fight moved into the later stages, but Fury stuck to his game plan and secured a hard-earned win, with the judges scoring the fight 119-110 119-108 119-108 in his favour. Meanwhile on the undercard, Chris Eurbank Jr enhanced his growing reputation as he extended his unbeaten record to eight professional fights with a 80-73 points win over Bradley Pryce.